What a wonderfully evocative quote. Last night’s full moon was the Honey Moon. Named so for the amber color we see at moon rise. The celestial orb takes on a honey glow because it shines through the thick layers of atmosphere at the horizon as it sits at one of the farthest points south on its orbit. We didn’t see moon rise and witness Night walking down the sky with the moon in her hand, but last night as we left our friends’ house, the moon shone bright between dramatically moonlit clouds. I just love when it does that ghostly galleon thing. 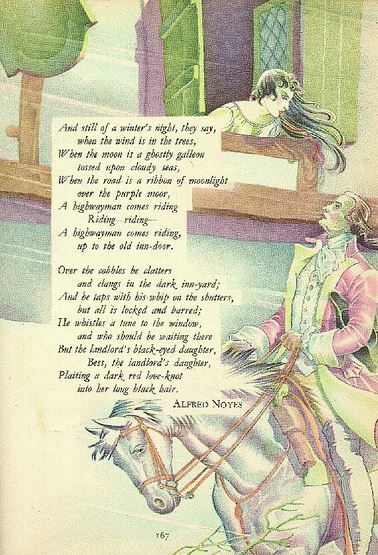 I refer to The Highwayman — a poem by Alfred Noyes (1906). Boy does that imagery tickle my imagination. It always has. That was one of my favorite poems when I was a child because the illustrations that went with it were just perfect. I can’t believe I found a page from the old Childcraft book online to show you. Proof again that the internet eventually has everything. There’s just something about the switch backs on the path that do a left/right massage on the brain. Our reasons for building it weren’t to get those results, they’re just a bonus. I’ll share why another time. Our Chartres is large enough to be seen with Google Earth. I’m of two minds on that. On one hand how cool to have your creation seen from a satellite and projected around the world. 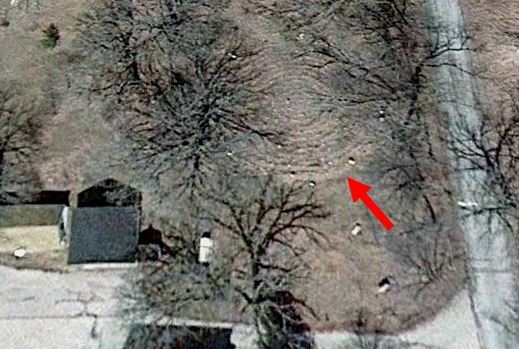 On the other hand how creepy and invasive to have your creation seen from a satellite and projected around the world! Here’s a winter view from orbit. Notice the size compared to the garage. It’ll take us about an hour to light the candles that illuminate every turn and corner. Imagine it outlined by little flickers of light at night. My fingers are crossed for a breezy evening even though that may snuff out some candles as soon as we light them. A nice breeze will keep the mosquitoes at bay though. There’s no contest as far as I’m concerned — lighted walkway vs. newly hatched mosquitoes. Like I said, no contest. But the weather is on my side tonight, not theirs. The forecast says breezy and a cool 55°. I couldn’t ask for better. I’m sure we’ll have a lot of walkers. There are 94 entries to come. This entry was posted in Past Posts - you'll never know what you'll find and tagged Chartres Cathedral, full moon, honey moon, labyrinth, moon phases, Romance, Rose Anderson, The highwayman. Bookmark the permalink. Nicely done. Well written and pleasing to the eye. O I am just so glad to see you back blogging! You are wonderful with my morning coffee. Thank you! This is beautifully written.